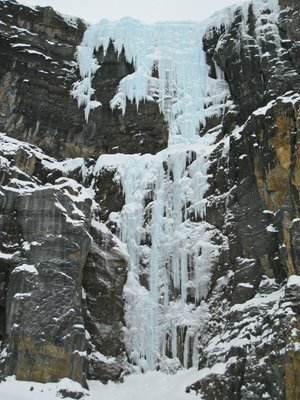 Since my first ice climbing trip to the Canadian Rockies in 2004 I have dreamed about climbing a route on the notorious Stanley Headwall. However, since the easiest routes are graded V, WI6 I frankly never thought that I would acquire the necessary technical and fitness level to climb one of these routes! 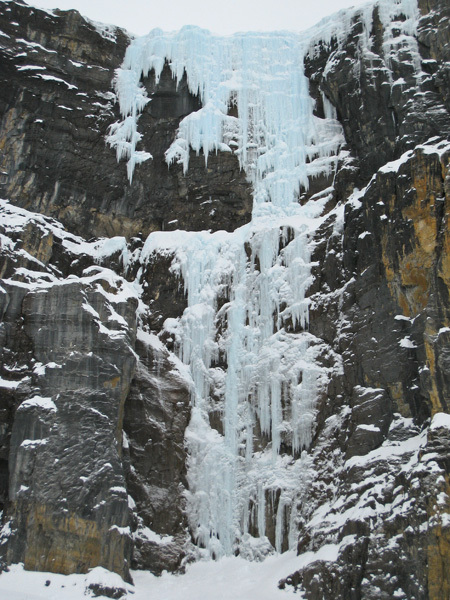 I was thus thrilled when Carlos suggested to climb the route Nemesis (160 m, V, WI6) as this is probably the most famous waterfall ice route in the Canadian Rockies with a rich history. 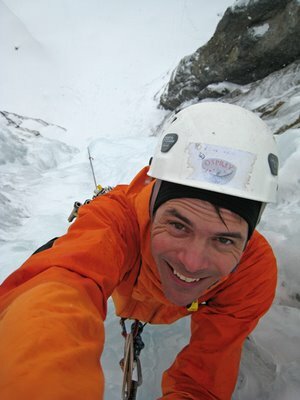 When it was first climbed in 1974 it was the hardest ice route in the world and Carlos had several attempts on the route until he finally finished it 20 years ago. It was thus kind of an anniversary climb for Carlos and I was glad to go with him. We skied up the slopes towards the Stanley Glacier for 2 hrs taking a good rest to talk to two Slovenians who had bailed from the final snow slope up to the neighboring route Suffer Machine. The snow slope had whoomped and with the current avalanche hazard they had decided to retreat. Luckily, the slope up to Nemesis is less risky and we thus decided to continue. It was, however, a bit unnerving to ski up the final snow slope towards Nemesis while looking at the impressive and difficult looking route. At the base of the climb we discussed which line to climb, where to make belays and whom would lead what. The climb is divided into two sections with a bolted belay halfway up under a rock overhang. Carlos had led the lower section on his previous ascent and it was thus a given that he would lead the upper section this time. I contemplated whether to use my leashes or not, and then decided against it. Later, negotiating the traverses on the second pitch I am once again happy for this decision. 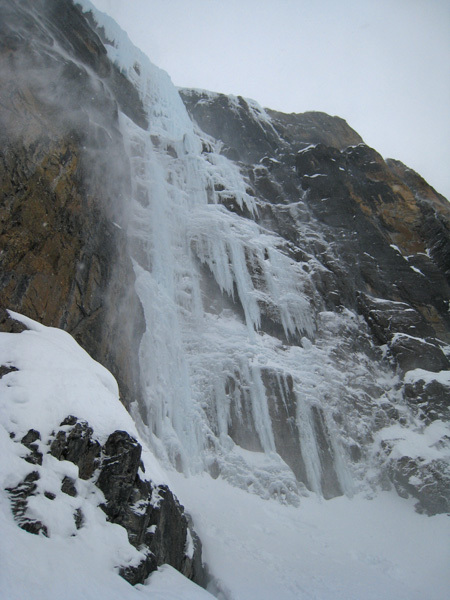 I began leading the lower section which consisted of 70-75 meters of a vertical ice sheet about 1-2 meters wide. The ice to both side were of bad quality/non-existing but luckily the ice sheet provided surprisingly good ice with largely good ice screw placements. Often I was able to stem out with a foot to ice left or right of the sheet which provided some rest for my calves and forearms. It was not possible to find a good sheltered belay as the narrow ice sheet provided the only good ice around and I thus decided to continue climbing. When I reached the end of the ropes 60 meters up I put in an ice screw and rested for a minute while Carlos got ready to simul climb the last 10-15 meters to the bolted rock anchor. 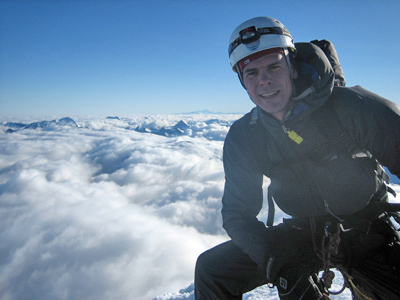 It is always a bit unnerving to simul climb – in particular on WI6 ice (!) - but I was certain that Carlos would not fall and drag me down – and I on the other hand was extremely careful not to dislodge any ice while leading the last section. I quickly clicked into the bolt anchor and put Carlos on belay. Now I could relax for a bit and take in the awesome position halfway up the headwall. Soon Carlos got to the belay and we then discussed the logical line of the next section which starts with an unnerving traverse on funky ice. 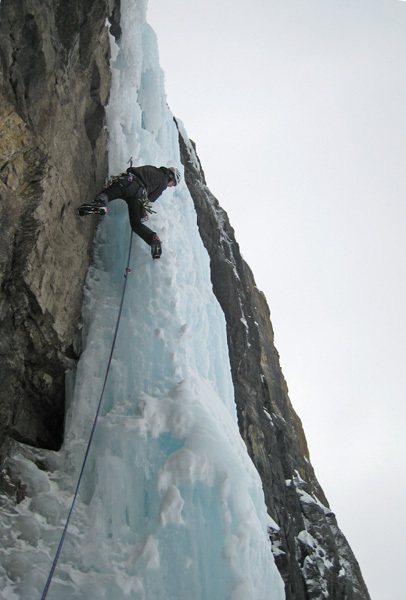 However the ice had formed a bit different than usual and Carlos thus took an alternative start climbing directly up the side of the icefall while stemming out on the rock. Soon he reached the rock overhang where he was forced out on the traverse in an interesting and ackward ice ledge/cave. Finally, he could climb upwards on mainly good albeit vertical ice until he reached a good ice belay after 50 meters of climbing. It had been overcast and grey all morning and it was beginning to snow. 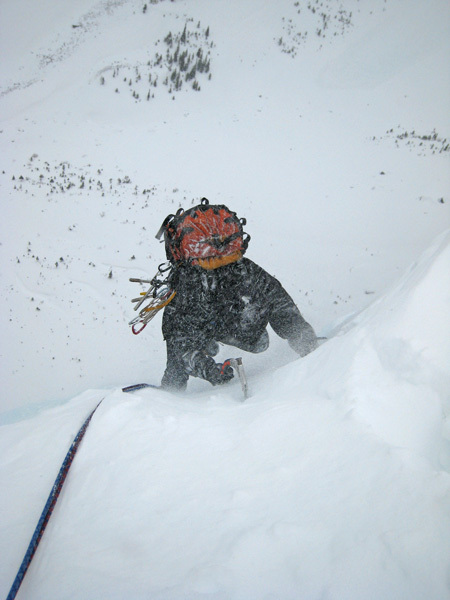 As Carlos was leading the second pitch enough snow had accumulated on the upper snow slopes to initiated constant spindrifts. I thus tugged in under my hood and began following his lead. Absolutely great climbing on featured ice. Leading the third pitch I traversed back to the left and climbed a logical line of ice in a grove. Climbing in the groove was both good and bad. Good as I could stem out with my feet to the sides while placing my ice axes in the center of the groove (in effect reducing the angle of the vertical climbing) – bad as the groove funneled the spindrift in my direction impairing my sight! At times I thus had to stop climbing while waiting for a pause in the spindrifts in order to see what I was doing. After 20 meters of climbing I reached the top of the route. I had been wondering if I would stick my head into a snow storm, but it was surprisingly calm at the top. What a great feeling to stand here on top of Nemesis! We quickly rappelled the route and began our ski descent. The initial slope was the steepest part with very loose powder snow, which was quite hard to ski in my leather climbing booths. I would loose control if I skied too fast and dive the ski tips into the powder if I skied to slow! I choose the slow version and thus dove into the deep powder a couple of times. It was so loose and deep that it was hard to get up again, but luckily I soon reached the donkey trail at the bottom of the slope which provided a good ski base for the remaining part of the descent. Back in the car I was so happy. 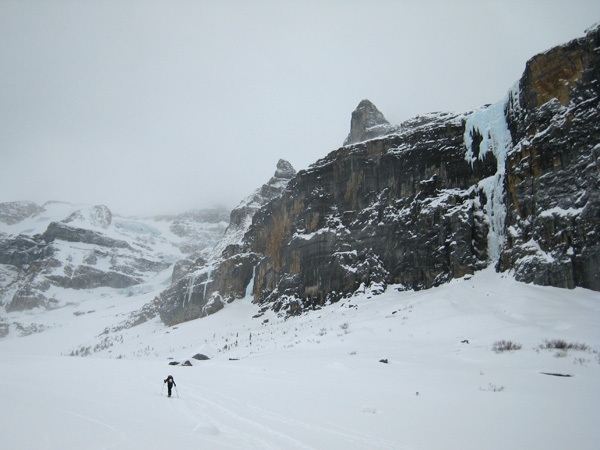 This was the perfect ending to my one month ice climbing trip – a true alpine experience with the ski approach, the classic Stanley Headwall route and the spin drifting. I actually couldn’t think of a better way to end this trip! 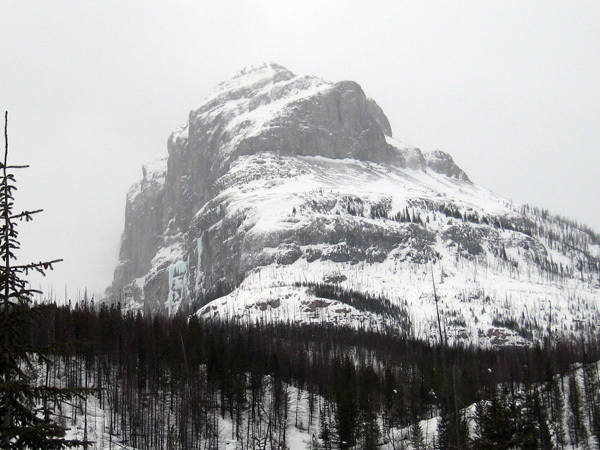 Stanley Headwall seen from the road. The visible ice is French Reality (right) and the Monsieur Hulot Area (left). Nemesis and Suffer Machine are not visible from the road. Carlos approaching Nemesis. The front of the Stanley Glacier is visible above him. Nemesis (160 m, V, WI6). The author resting in a screw 60 meters up the first pitch waiting for Carlos to get ready to simul climb the last 10-15 meters to the bolted rock anchor. Carlos taking a mixed start of the upper half of the route. Carlos topping out in spindrifts. A look up at the spindrifts on the route after we rappelled down. Click here to see short QuickTime video of Carlos and I discussing the climb after the rappel.